to New Year's Eve within just a few days for me. and when it is all over is a bittersweet, isn't it? without that never-ending "To Do" list running through our heads. Then it hits us! Yikes! New Year's Eve Dinner is in a few days!!!! I decided to keep things unfussy and simple. I am using my red starry plates and gold flatware again but brought out crisp clean and bright white Damask and my clock plates. The clock face plates have blue and gold stars which work with the red and gold starred dinner plates. and another new year beginning. from my youngest daughter's new boy friend. makes any colour look lovely! How sweet that your daughter's new friend brought you such beautiful flowers on Christmas Eve! Wow! I thought chivalry might be dead, but apparently it was only taking a nap! :-) Major brownie points scored there! :-) I love your plate combination!!! The clock plates are just SO COOL!!!!!!! I REALLY like them!!! You're right...they work really great with the starred dinner plates beneath them! There's just a whole kind of magical look about it all! I'm so glad you enjoyed a great Christmas Eve celebration, and I wish you and your family (and the very considerate new friend!) a very happy New Year! Lovely everything! That new bf has potential! Christmas is still going on at our house and will continue until Epiphany. The white is so soothing, perfect for New Year's Eve. Best wishes for the coming year! Love your plates, everything is just beautiful and the snow out the windows is perfect for a New Year's setting! The salad plates are too cute and are an excellent transition to New Year! Ohhhh...how lovely! I enjoy Christmas all the way through and following Epiphany. I decided long ago not to let go. There are some Christmas things that will remain out all year and that's another little trick I use to move forward. The choices you've made with dish selection is perfection. Who wouldn't enjoy sitting down at that table and having a New Year's Dinner?! The snow does look fine and beautifully new and white. Can I say "perfection" again or is it too soon? Hi Michele, your dinnerware is lovely. Perfectly festive and fun! Do enjoy seeing the snowy landscape in the background. May God bless you and your family during this Christmas Season! 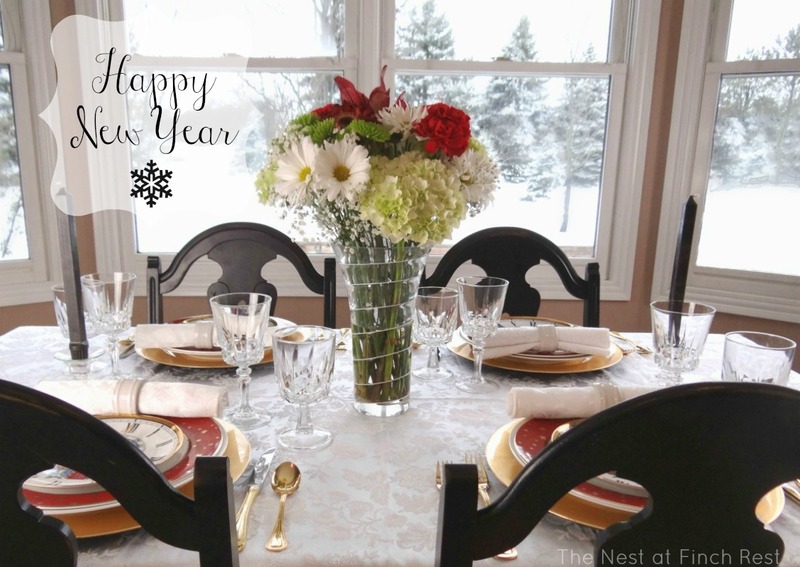 Lovely New Year tablescape. Enjoy the snow! Happy New Year! 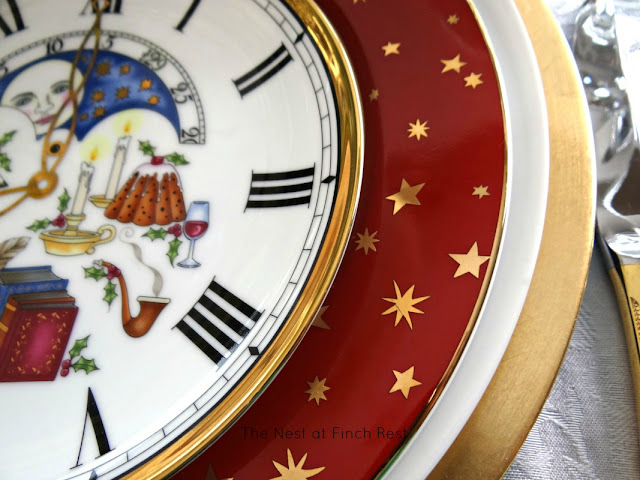 I love the clock dishes and the red stars dishes also! How about sharing where you got them? They are just lovely and I know I would enjoy them for years! Will you tell us who made them both at least? Thanks ahead of tiem! I'd say the bf is a keeper also! We also celebrate Christmas until epiphany, and like Vee above, I keep some angels, and my Elvis Christmas drive in theatre out all year! lOL...can't put Elvis in the closet! Love your work! Those dishes are perfect! You are right the snow is a lovely backdrop. We are getting some now so my movie plans got postponed. I enjoyed reading your thoughts on it. Michele, this is a wonderful tablescape. I just love those clock face plates. They are PERFECT for this New Year's Eve setting. Love it! I always wanted to make a New Year's tablescape! Yours is wonderful, Michele. I love the clock plates...they're perfect. 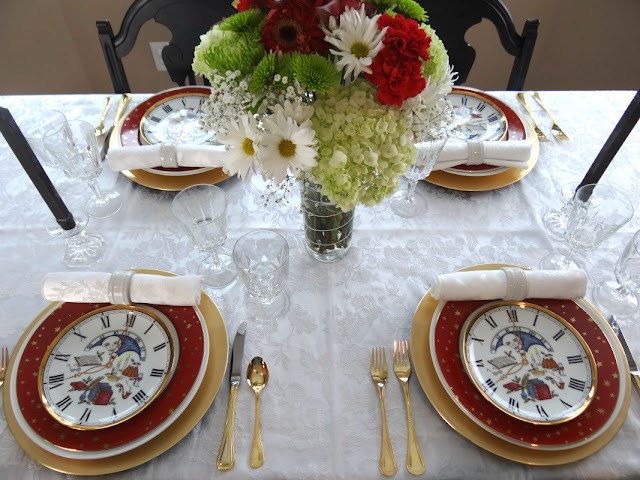 I wish I had the dishes to make a New Years table this pretty! 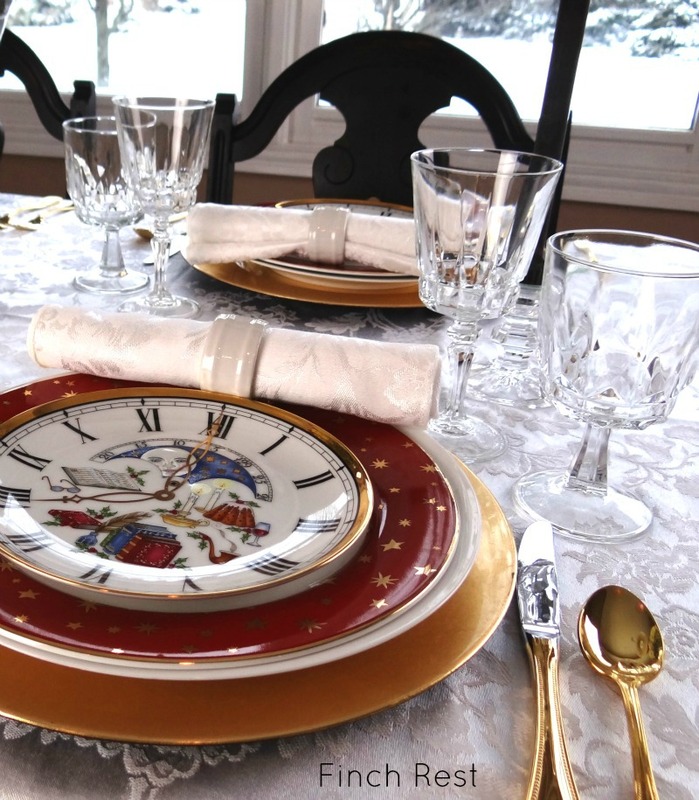 The clock plates are so sweet as well as the snowy landscape out the window! I am the same way about my Christmas home...it is just too bittersweet to put away. And I love how it reminds me of all the hope and joy I put into making it the most wonderful Christmas ever! Love, love, love this! What perfect plates for the New Year. What a really great New Years table. 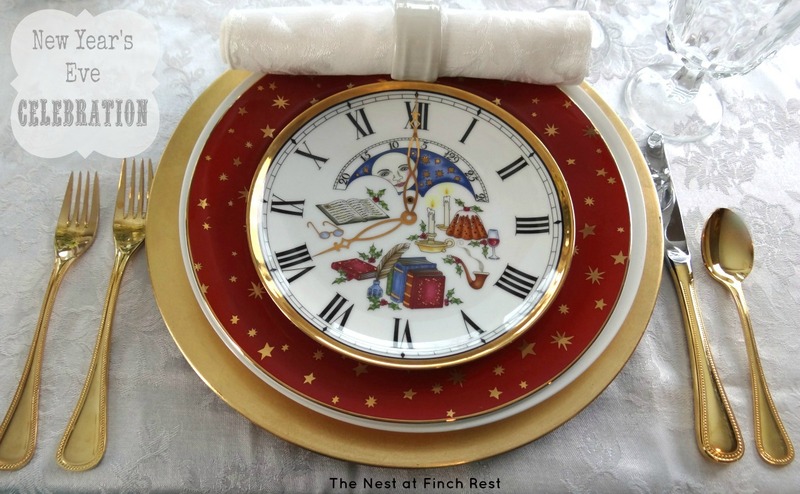 Love the clock plates anyway, but they look great paired with the star plates and so nice you had the gold flatware to go along with it. Very rich and unique. Happy 2013 and thanks for linking to Let's Dish! You couldn't have picked better plates for a New Years table...love them. Happy New Year to you, Michele. Hello Michele! These clock plates are fantastic, I've never seen them. Beautiful Michele! Love the frosty snow outside the window. I love your dishes. Especially the clock salad plates. They are fabulous. Wishing you a wonderful '2013'! Beautiful table setting! I have had company all week .. and until Jan. 2! .. so I haven't had time to think about a dinner yet. Your plates are so pretty! Happy New Year.. wishing you the best i 2013! Your colors are wonderful and I am in love with those clock plates. I definitely have plate envy. Enjoy a lovely New Year's dinner. ENDING GIVEAWAY A BIT EARLY! Cookies! Cookies! Cookies! OH! MY!